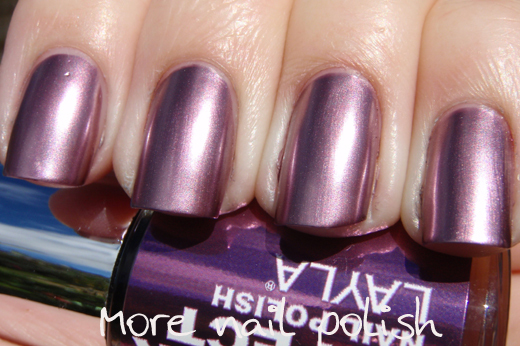 Here is the second part of the Layla Mirror Effect polishes. Red Hot - dusty dark pink, definitely not red as the name would suggest. Metal Plum - dusty rose pink. Black as Ebony - gunmetal grey. My only disappointment with this collection is that a number of the shades are very similar in colour. A lot of dusty pink and mauve shades. 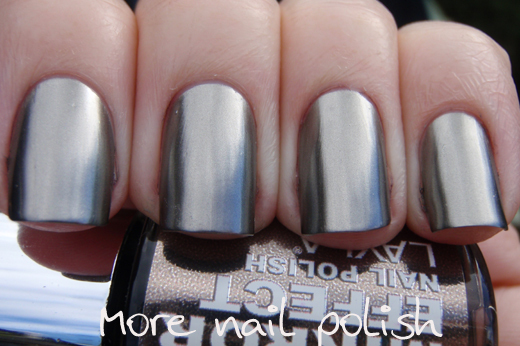 I love Metal Chrome, Titanium Sky and Black as Ebony, but I would happily settle with just one of the other shades, as they are all so similar. Instead I wish there was a gold, and a green and a blue toned purple (not a pink toned one). I think a Mirror Sandwich would work well with these polishes. 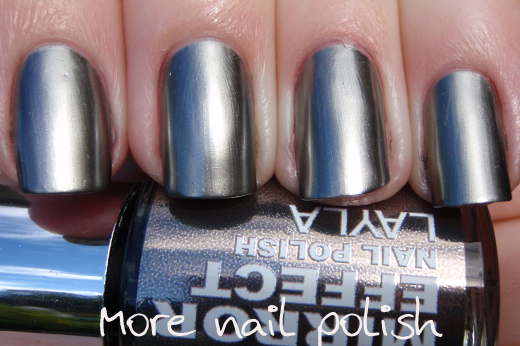 Eg Shiny base coat (or top coat as a base), mirror effect, top coat, mirror effect. 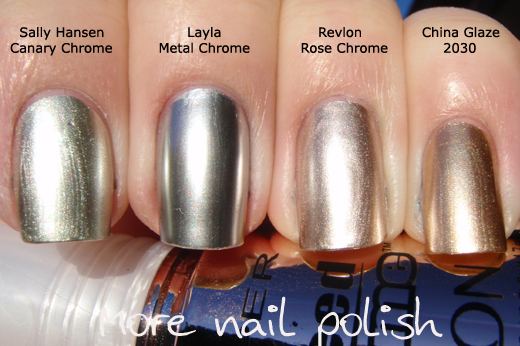 Finally, I did a quick comparison photo of Layla Metal Chrome against some of the other chrome polishes I have. Sally Hansen Canary Chrome is on the index, Layla on the middle, Revlon Budding Chrome (sorry incorrectly labelled in the photo) on the ring finger, and China Glaze 2030 on the pinky. As you can see, the Layla polish is pretty damn special in the way it is brush mark free and ultra smooth. 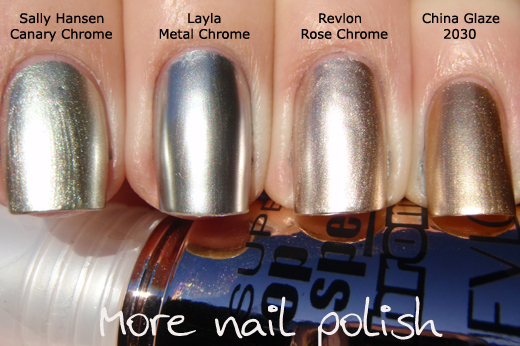 It makes the other chrome polishes look like foils. Unfortunately I don't own other silver chromes such as Stargazer metallic or Maybelline Mirror Image so I can't comment on how similar the Layla Mirror Effects might be. I bought these Layla Mirror Effects direct from Layla Cosmetics in Milan, Italy. The bottles are 10ml and they cost €12.20 each. Yes, expensive for US ladies with access to many brands of cheaper polish, but an acceptable price from my perspective as an Australia where OPI retails for $20 and Revlon for $15. Shame about the wear, but I think it looks so amazing when compared to the other chromes. I wish I had got the black one, but next time! Thanks for the fantastic swatches! Shame about the wear, the sandwich idea sounds good! I would have liked more colours too but it did prevent me from ordering more than three. A gold would be perfect for you! 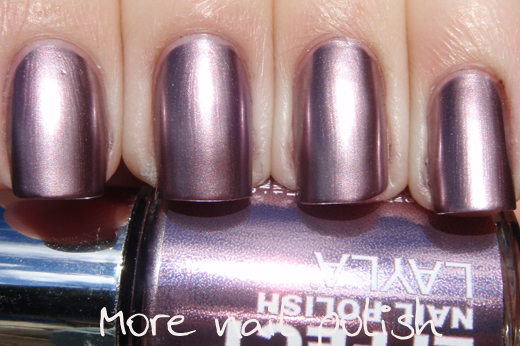 Thanks for the comparisons, the Layla does make the others look like foils! Aaaaaaaaaaaaaaaaaahhhhh...I only have one regret: That I didn't get more! I probably won't get the ones with similar colours, but I could have done with a purple mirror. I just wasn't sure if they would be as mirror-smooth as advertised. They certainly seem to live up to their name from your pictures. I can't wait to try mine on when it arrives! Their look so impressive. I'm definitely amazed by Layla. They do everything... just right. i'm loving black as ebony! Looks just like these terminator leggings I own! LOVE! Wow...these are really something special! Fabulous comparison! 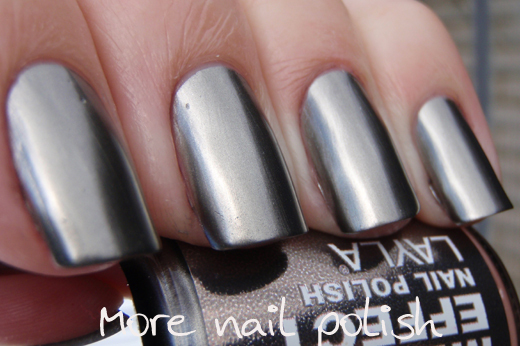 I want this polish! Wow, it's so clear and even. 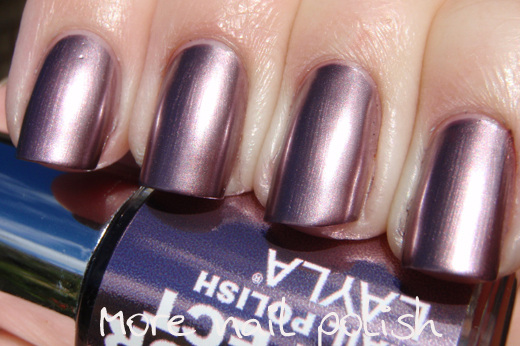 I guess you have to expect it would chip easily, though, especially without topcoat. i hope these come to the us SOON! i've never seen a smoother mirror like metallic!